67 Hand painted watercolor elements to let you design your own special Christmas Card or any other design element (such as facebook background pic, graphics for events or even posters for high quality print). Add fire to your photo manipulations with the best explosion brushes we've seen to date! 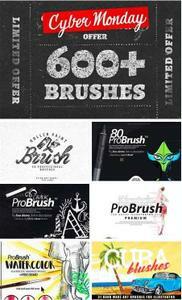 These brushes come with a Photoshop gradient preset and JPG alternatives to make your work easier. Use the included Gradient Map preset to easily colorize your explosion Photoshop brushes.